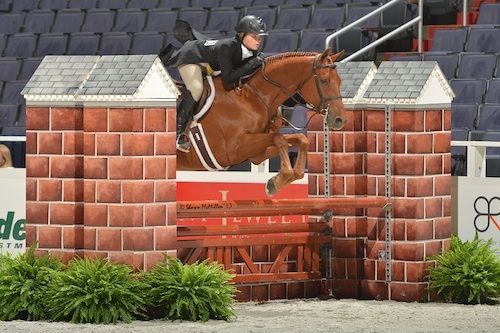 Washington, D.C. – October 22, 2013 – The 55th annual Washington International Horse Show (WIHS) hosted its opening day at Verizon Center in downtown Washington, D.C. on Tuesday with a full day of hunter competition. 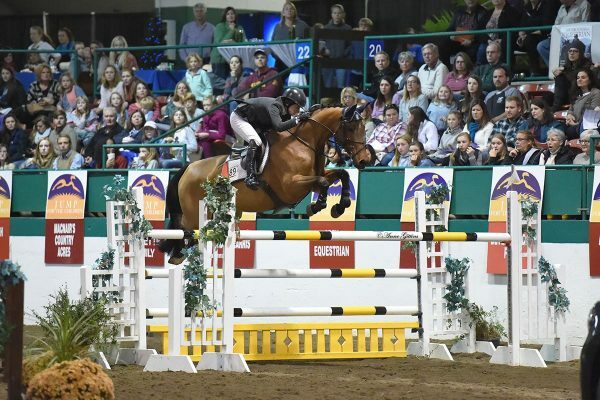 The professional and amateur-owner riders showed throughout the day in the first classes of their divisions and will conclude their competition for championship honors on Wednesday. The children’s and adult hunter riders competed for their championships in the evening. The WIHS continues its six-day competition through Sunday, October 27. 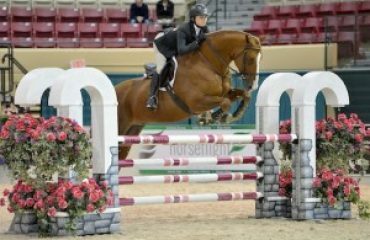 The $10,000 WIHS Children’s Hunter Championship featured 31 entries on Tuesday competing over a course set by J.P. Godard of Aiken, SC, with the top 12 entries returning for round two. 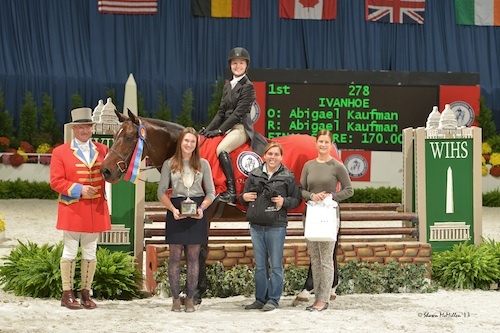 Fifteen-year-old Abigael Kaufman of Chevy Chase, MD, came out on top with high scores of 86 and 84 for a combined total of 170 aboard her mount Ivanhoe. For their win, the pair was awarded the H. Fenwick Kollock Memorial Perpetual Trophy, donated by Friends of Fen. Kimmee Gottwald and Catina finished second with scores of 91.5 and 76 for a 157 point total. Third place honors went to Darby Cole and Valerie Renihan’s Tuscan Sun with a pair of 77 scores to total 154. 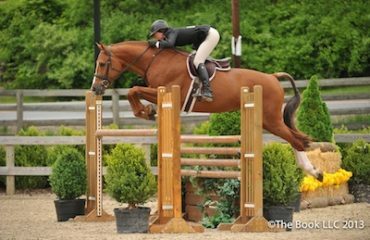 Abigael Kaufman trains with Alan Lohman and has leased Ivanhoe, a 17-year-old Selle Francais gelding, for two years now. 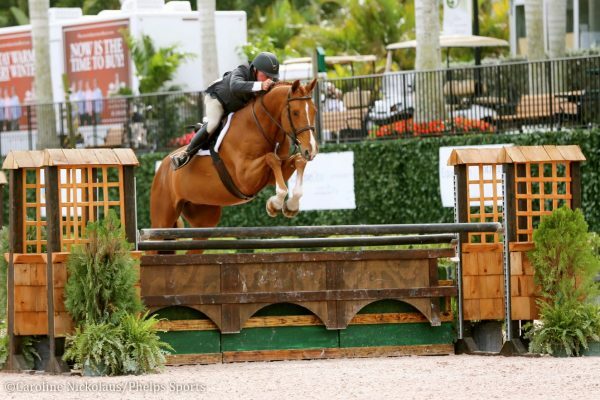 The pair has shown together in the Children’s Hunter and equitation divisions. “We’ve just been doing local shows trying to qualify for zone finals and we finally qualified for Washington, which was a very nice end to the year,” Kaufman noted. Although she showed at WIHS with a pony two years ago, this was the rider’s first time competing on a horse, and the experience was a little different. The experience of competing in downtown Washington D.C. is always exciting, with the horses temporarily stabled in the streets surrounding Verizon Center, and people walking through the city day and night. Ivanhoe and Kaufman handled the city setting likes pros and put in two winning rounds. Kaufman described Ivanhoe as a very slow horse that takes a lot of leg and commented further on her rounds. 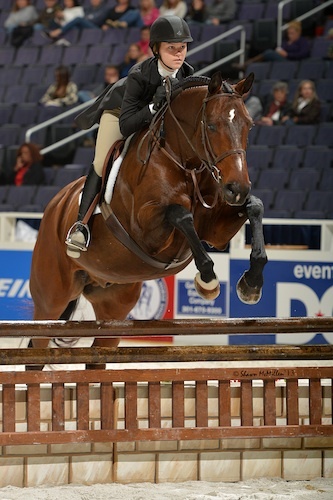 The $10,000 WIHS Adult Amateur Hunter Championship concluded day one at the 2013 WIHS with 29 entries showing over the first round course and the top twelve returning. Dudley MacFarlane of Darien, CT, rode her 17-year-old Royal Dutch Warmblood gelding Authentic to the championship with scores of 87 and 85.5 for a 171.5 point total. Devon Braswell and Showgirl placed second on a two-round total of 171 with scores of 85 and 86. 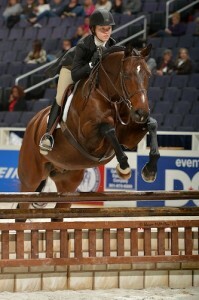 Daryl Whitmoyer and Sweet Potato Pie earned an 84.5 and an 85 to finish third with a score of 169.5. Dudley MacFarlane has had her winning mount, Authentic, for 13 years since purchasing the horse as a stallion when he was four years old with the help of then-trainer, Jimmy Toon. The pair has shown all over the country in their years together, and Authentic now spends most of his year living in a field and going on trail rides on MacFarlane’s farm in Charlottesville, VA. He showed in order to qualify for the championship this year and completed his years of showing at WIHS with a well-deserved victory. 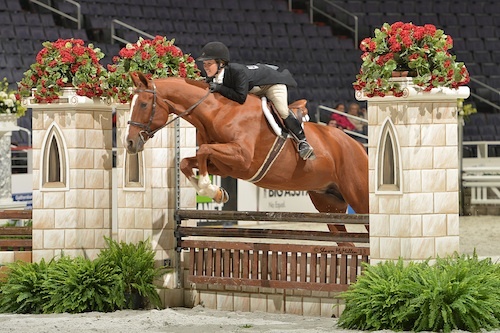 MacFarlane and Authentic showed at WIHS in the amateur 3’6” division multiple times and also showed in the Adult Hunter Championship last year, but MacFarlane explained that Authentic was a little starstruck with the jumbotron in the arena. This year they put a computer screen in his stall to get him ready for the competition. In addition to their championship ribbons and coolers, the winners of the Children’s and Adult Hunter Champions were each awarded a pair of custom chaps courtesy of Journeyman Saddlers, Ltd.
Also showing earlier on Tuesday, the professional hunter divisions completed their first day of competition at Verizon Center with several winning rounds for Kelley Farmer of Keswick, VA. The Robotyping Challenge Trophy was presented to Farmer’s mount Mythical, owned by D. Larry Glefke and Dr. Kenneth Garber, for the best Green Working Hunter round of the day with a high score of 90. Farmer also accepted The Fairfax Hunt Race Association Challenge Trophy for the best Green Working Hunter handy round with a score of 89 aboard D. Larry Glefke and Quail Run Partnerships’ Skorekeeper. 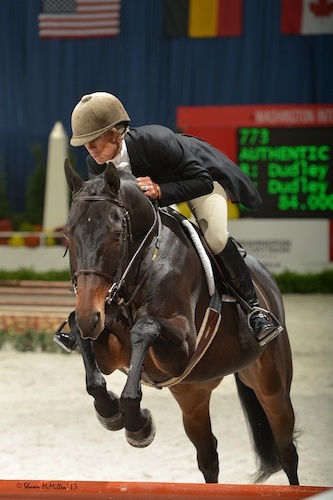 The Washington International Horse Show continues tomorrow with championships for the professional and amateur-owner hunter divisions as well as the $10,000 Children’s Jumper Championship during the day. The evening session, which begins at 7 p.m., will feature the $10,000 Adult Jumper Championship and the $10,000 Open Jumper speed class. 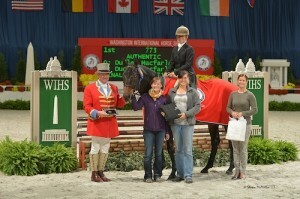 For full results, more information, or to watch the free live feed of the show, please visit www.wihs.org. Photo Credit: Photos © Shawn McMillen Photography, www.shawnmcmillen.com. These photos may only be used in relation to this press release and with full photo credit. 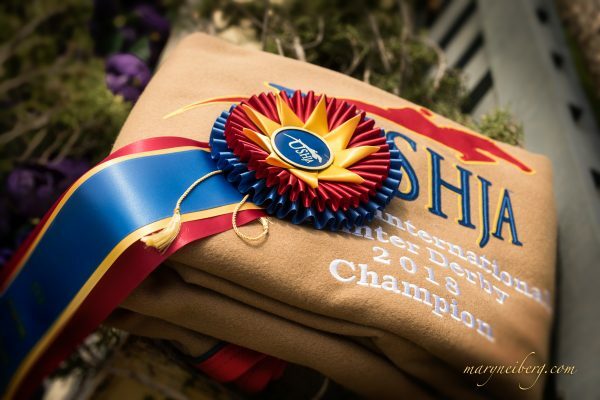 An equestrian tradition since 1958, the Washington International Horse Show is the country’s leading metropolitan indoor horse show and the pinnacle of the equestrian year with leading riders, including Olympic medalists, and fabulous horses. 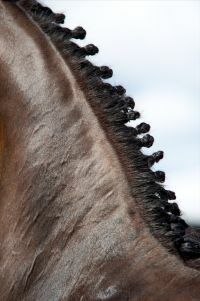 More than 500 horses participate in show jumping, hunter and equitation events during the six-day show. 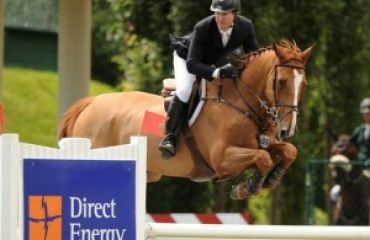 Highlights include the $125,000 President’s Cup Grand Prix, the Puissance high-jump competition; and WIHS Equitation Classic Finals featuring the country’s top junior riders. Special exhibitions, boutique shopping and community activities will round out this family-friendly event. Since its debut, the Washington International has been a Washington, DC, institution attended by presidents, first ladies, celebrities, business and military leaders, as well as countless horse enthusiasts of all ages. 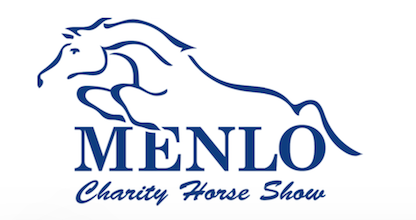 Washington International Horse Show Association, Ltd. is a 501(c)(3) nonprofit charitable organization headquartered in Washington, D.C.